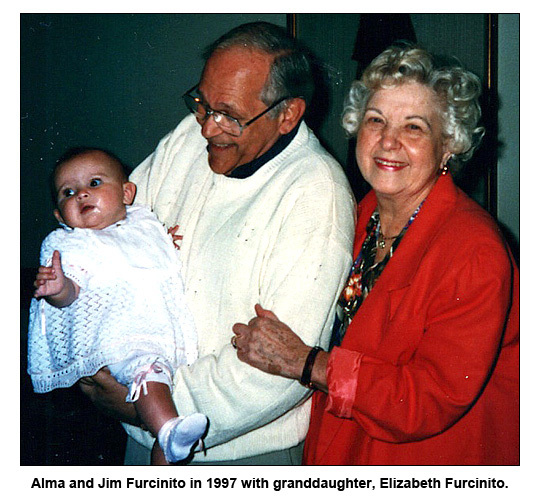 The passing of my cousin Alma Kaldowski Furcinito in July (2012) was, of course, a sad event, but one for which we were long prepared. She had lived in pain for several years, the result of a chronic back problem that eventually confined her to a wheelchair. For a long while Alma's personality seemed unaffected. Oh, she'd complain about her condition, explain and analyze it, but quickly move on to other things. My wife and I visited the Syracuse area infrequently in recent years, but when we got together with Alma, she always seemed to pick up where she left off. My first indication that her condition had worsened came about a year before her death when I phoned her and she told me she didn't feel like talking. Even in sadness I can't help but think of the Alma I knew many years ago. She was quite a character, one who had what some might call the gift of gab, though, frankly, we occasionally described it not as a gift, but a curse. When you called Alma, or received a call from her, you had to be prepared for a long conversation, most of it one-sided. Both Alma and her mother had a wonderful attitude toward their gift. Neither was disturbed if you raised your voice and demanded to be heard. Both would smile, listen, then resume as soon as you were finished. Alma was born in 1927, thus was eleven years old when I arrived. She was my first babysitter, though she was more like an older sister because she spent a lot of time with my parents, particularly my mother, who remained close to Alma for the rest of her life. Family photos taken during the early 1930s indicate Alma went with my parents during daytrips and on family vacations to Sandy Pond. If my sister, Mary Beth, and I harbored any resentment toward Alma it was because of the piano lessons that were inflicted upon us because Alma had taken them earlier. And if they were good enough for Alma, my mother reasoned, they were good enough for her children. Still it was Alma who provided the most memorable moments on our piano, when she was in her late teens or early 20s. In a moment of wild optimism, my mother purchased the sheet music for "Zip-a-Dee-Doo-Dah," a hit song from Walt Disney's movie, "Song of the South." It proved far beyond my ability or my patience, but one afternoon, while Alma was visiting, she decided to give it a try ... with limited success. As I recall, she was still practicing the song after my sister and I were tucked into our beds. Alma had a good heart, a great sense of humor and a wonderful laugh. She also had a lot of opinions and freely dispensed advice of a wide variety of subjects. She and her husband, Jim Furcinito, had two sons, James and Peter, and lived in Liverpool, New York. James Jr. settled in Texas, Peter took over the family business, Furcinito Builders, Inc.